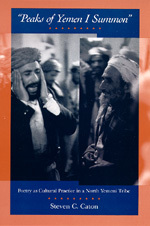 In this first full-scale ethnographic study of Yemeni tribal poetry, Steven Caton reveals an astonishingly rich folkloric system where poetry is both a creation of art and a political and social act. Almost always spoken or chanted, Yemeni tribal poetry is cast in an idiom considered colloquial and "ungrammatical," yet admired for its wit and spontaneity. In Yemeni society, the poet has power over people. By eloquence the poet can stir or, if his poetic talents are truly outstanding, motivate an audience to do his bidding. Yemeni tribesmen think, in fact, that poetry's transformative effect is too essential not to use for pressing public issues. Drawing on his three years of field research in North Yemen, Caton illustrates the significance of poetry in Yemeni society by analyzing three verse genres and their use in weddings, war mediations, and political discourse on the state. Moreover, Caton provides the first anthropology of poetics. Challenging Western cultural assumptions that political poetry can rarely rise above doggerel, Caton develops a model of poetry as cultural practice. To compose a poem is to construct oneself as a peacemaker, as a warrior, as a Muslim. Thus the poet engages in constitutive social practice. Because of its highly interdisciplinary approach, this book will interest a wide range of readers including anthropologists, linguists, folklorists, literary critics, and scholars of Middle Eastern society, language, and culture. Steven Caton is Professor of Anthropology at Harvard University.